First of all, what is search engine optimization (SEO)? It’s the art and science of increasing the natural visibility of a website or page in a search engine’s results. So, if you want to earn extra traffic and rank on Google through organic methods (in other words, without paying for advertising), then you will need to do SEO. Magento is one of the most comprehensive e-commerce platforms on the market. It also has excellent features for SEO, allowing stores to get ahead of their competitors. Having a site that follows SEO best practices will drive additional traffic to your site, which in turn will boost your revenue. However, the complexity of the platform makes it a challenge for merchants to realize the full potential of Magento’s SEO capabilities. This challenge is further accentuated by Google, which has over 200 ranking factors. To make it even more tricky, no one outside of Google knows what they are. As a result, SEO is often overlooked and neglected. This is the perfect opportunity for you to get an edge in your industry. Page load time: Google’s search algorithms can prove tricky to master. One factor we know that matters significantly is your page load time. A slow site is not only bad for user experience but also affects your rankings. This was a familiar issue with the first version, but Magento 2 has proven to be quicker. There are still steps you need to take to ensure your site performance is up to standard. Using canonical URLs: On an e-commerce site, you are likely to have duplicate pages under different URLs. A canonical URL is the SEO-friendly version that will get picked up by algorithms and displayed in search results. This will be explained in greater detail later on. Use of keywords: The easiest way to let Google know what your page is about and what it should rank for in the search results is by using those keywords in your permalink. Product Reviews: Enabling product reviews will significantly help with your rankings. They help add user-generated content, keep your site fresh, and vary keyword terms, three things Google loves. You effectively get your customers to work for you and increase your conversion rates at the same time, thanks to the power of social proof. With Magento 2, you can control each of these factors to increase your SEO capabilities. This guide will show you how to do it. Before we even begin to look into what you can do to boost your SEO capabilities, you need to look at your site as a whole. This involves doing an SEO audit. Technical Analysis: This looks at things like accessibility, your sitemap, and whether your site has any error pages, for example. On-Site Analysis: After resolving the technical issues, it’s time to look at the creative aspect. This will involve content, keywords, and the structure of individual pages. Off-Site Analysis: Essentially, this measures the popularity of your site. It measures how much traffic you are getting, how many backlinks you have, and where the traffic is coming from. The overall picture will give you an idea of the authority of your site. Competitive Analysis and Keyword Research: Learning from your competitors is one of the best ways to get ahead. Mixing this up with keyword research is a winning combination. Using a tool like Moz will help you analyze the weak points of your site and identify where you can improve. It is important to take a look at the complete picture and not to skip any steps. Though keywords are not the only driver behind SEO, they are undoubtedly the most important ones. You need to identify the right keywords that are realistic and relevant. Pick a keyword too competitive and you’ll be stuck on the second page forever. Choose one that no one is searching for and you’ll have done all that work for nothing. 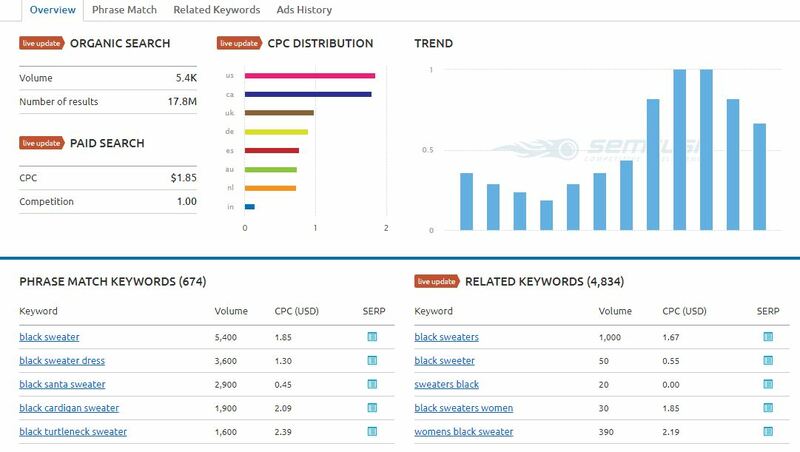 SEMrush has an excellent tool that helps you to decide which keywords to choose. As you can see, SEMrush offer a detailed analysis of your keyword. It gives you an indication of how many people are searching for it and suggests alternative phrases. In today’s global marketplace, SEMrush offers analysis for different countries including the US, UK, and Germany. This will help your products reach a wider audience and drive additional traffic to your site. If you want to get even more specific, Long Tail Pro is a tool that helps you find those low competition keywords. A good example would be instead of black sweater, targeting black Nike sweater with stripes. As briefly mentioned earlier, one of the main frustrations with Magento 1 was the slow performance of sites. With Magento 2, it has proven to be better but you can still do more to maintain or improve load time. This starts with enabling caching on your site. Once you have it set up, your site visitors will enjoy a much quicker and smoother site experience. The vast majority of e-commerce stores will be reliant on images, which can have a measurable impact on load time. This largely comes down to one factor: image size. The first thing you need to do is to set the resolution of your image. The higher the resolution, the larger the file size, which will increase the load time. The resolution of the image should be limited to the size you want the image to be displayed at. A high-resolution image for a thumbnail is a complete waste of your users’ resources. The second way to reduce file space is to compress the image. There are a number of free extensions that allow you to do this including Image Optimizer for Magento from Apptrian. You should always check for image quality after any reduction in file size. We cannot talk about image optimization without touching on the subject of alt-text. It has another critical purpose. Google (and other search engines) can’t see images, they only see the code and text on the page. By adding the alt-text (and modifying the file name) you’re telling Google what the image is about, further indicating your relevance to the keyword you’re trying to rank for. The key is to make sure the alt-text is relevant to the image. For example, the above image is displaying a black men’s sweater. Avoid simply using the keyword, which will look spammy for Google’s algorithms and could result in a penalty for over-optimization. Good Alt-Text: A black sweater for men. As you can see, the bad example looks spammy, whereas the correct version is simple, to the point, and relevant. 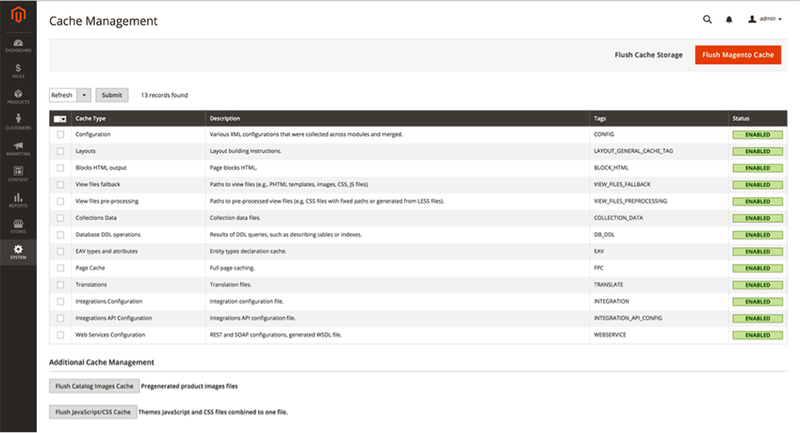 In Magento 2, you can set up the image tags and text each time you upload an image. The developers at Magento have made it easier for merchants to optimize their own sites. Whereas before you needed a plugin, Magento 2 allows you to do it within the system. Once you have completed the product description, there’s an entire section dedicated to SEO. The page has all the elements needed to ensure your product descriptions are fully optimized for SEO. URL Key: This gives you the opportunity to come up with a unique URL that includes your keyword. Outside of the Magento communities, you’ll also see this referred to as the permalink of a page. Meta Title: A meta title is what appears in the headings of Google’s search results. Once again, include the keyword so search engines can find it but also make it readable. Well-written meta tags do not directly influence SEO but they do drive up your click through rates (CTRs) in the search results, which is a ranking factor and will help you by driving more traffic to the site as well. Do not fill out the Meta Keywords box. Google has admitted that they do not take these into consideration anymore. Furthermore, it allows competitors to see what keywords you are targeting. You should ensure the SEO section is consistent with the product description that will appear on your main page. 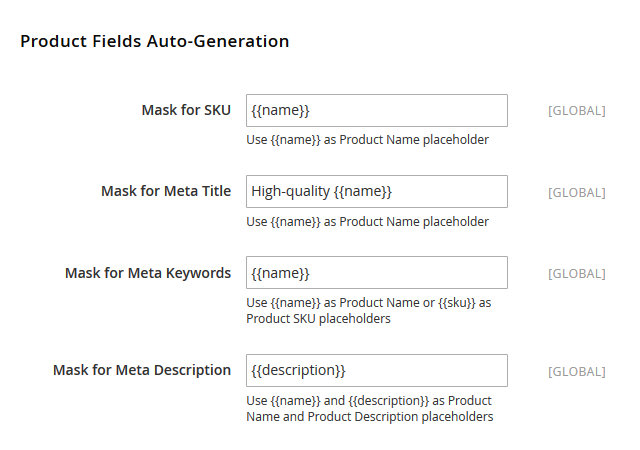 Magento 2 has a Product Fields Auto-Generation function. This auto-populates all the meta tags above based on the main product description. Resist the temptation to use it because it will simply mean you will have the same descriptions as your competitors, which will make it harder for you to stand out. 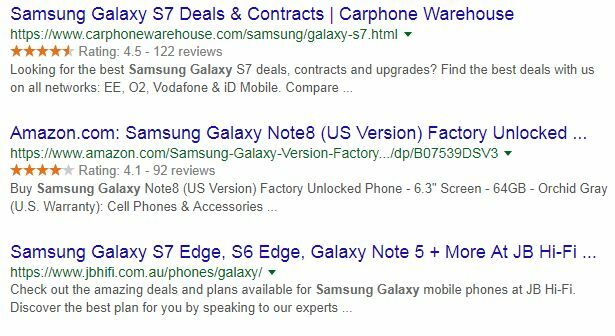 If every website has the same content (product specifications) word-for-word, how will Google know who to place at number one? By the number of backlinks. The odds are high that Amazon and Walmart will leave you in the dust in that regard. It’s good to have this configured because every page will at least have something as the meta-data, but you should make it your number one priority to customize each of these as soon as possible and create some unique content. Product reviews are one of the most powerful tools in marketing. Studies suggest that 92% of customers read reviews online, underscoring its influence. Fresh content: Google loves fresh, relevant content on your site. Opening your store up to product reviews is an excellent way of doing this. Target more keywords: Customers will use a variety of terms to describe your product. When they use those terms on your site, they will be picked up by Google. The added bonus is that your site will rank for a wider range of keywords. On the Admin sidebar, find Stores > Settings > Configuration > Catalog > Product Review. Once you have expanded the product review section, you can allow guests to write reviews. Given the power of product reviews, you should seek to promote them wherever you can. Since Google looks favorably on user generated content, it would be a good move to enable them to be found in search engines. As you can see the top two links have reviews enabled, with the third going without. This is because the links with reviews are more popular and receive more better CTRs, a key factor in Google’s algorithms. Magento 2 allows you to incorporate these ratings into your search results, with the Schema markup being added as a default. Each URL should be set up with SEO in mind. Including the categories and product keywords are essential steps to optimizing your site. As you can see, it’s a very simple, easy to follow format. Another rule is to avoid unnecessary stop words like “and” or “or.” So if you have a category entitled “Sports and Leisure,” you can set the URL to just focus on the keywords. Additionally, you should use hyphens rather than underscores to separate the words, otherwise Google will view it as one word. In the case of where one page has multiple URLs, a canonical meta tag tells the search engines which page is the original one. 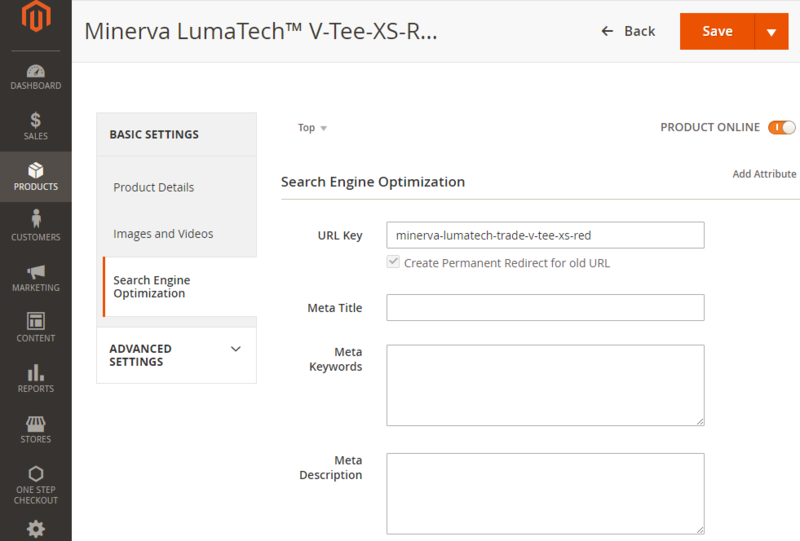 You can find the settings under: Store>Settings>Configuration>Catalog and then expand the Search Engine Optimization page as above. We recommend you opt for the “Use Canonical Meta Tag for Categories” while disabling the products tag. This will make it much clearer for the algorithms to index the pages you want to be ranked. To get even deeper into setting which pages Google should index, you should use Robot.txt. This can be found through: Stores > Configuration > General > Design and you will be able to define the settings to your preference. This is particularly handy if you do not want your search pages to be indexed or areas of the site that is used for development and testing. Taking this step will ensure the relevant pages from your site will get indexed, while ignoring the irrelevant ones. One of the best ways to build SEO is to have internal links within the site. Enabling the “Related Products” function within Magento 2 will deliver good customer service and help build up links. As you can see, Amazon takes the opportunity to cross-sell its products while increasing their visibility in search engines at the same time. Search engine algorithms are getting smarter at finding high-quality, relevant content. This should include creating unique descriptions for each product. It needs to include headings as well as long tail keywords to really make it count. With any product, these extensions need to be handled correctly. Once you get a grasp of it, your site will benefit significantly from a more efficient SEO strategy. The key to being fully set up for SEO is attention to detail. Magento 2 has all the components required to ensure your e-commerce store is found by search engines. However, it requires you to thoroughly configure the system. In a sense, the first step is the most important one. Carrying out a full SEO audit will give you the complete picture and identify the weak points of your site. An agency or your in-house marketing team will be able to analyze the results and set out exactly what needs to be done. From the URL to the product descriptions, there are many factors that affect your site performance. This means taking a holistic approach to your SEO strategy. If you are looking for more efficiency, use one of the extensions previously mentioned or approach an agency. The potential of SEO within Magento 2 is too great to miss. Great write-up on Magento. I have been working with Magento for about 8 years now. I would stress to include the new limit for description snippets in Google, which used to be 160…and now are around 230. This allows you to really put some great content in their to push Google searchers to click on your listing instead of a competitor. I would do it for at least your top landing pages.